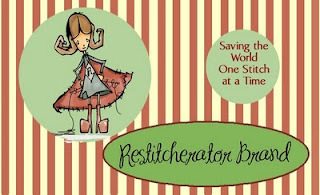 The Restitcherator: Ally gets featured and I won a gift certificate! Ally gets featured and I won a gift certificate! An online fabric store where I buy quite a bit of my fabric is called Above All Fabric. The owner, Melanie, has a flickr group, where she asked people to share pictures of things they've made with fabric purchased at her store. After people posted, Melanie chose some to write a blog post about on HER blog. Well, not only did one of the first try pics of Ally in the Julia outfit make it onto Melanie's blog, but I won a $25 gift certificate! Talk about feeding someone's habit. Melanie also has a new feature at her shop where you earn points for all of the fabric you buy, that can be used, or saved and used towards future orders. Wowee! I'll post what I buy with the certificate, but in the meantime, I'm making more upcycled napkins and some special order baby blankets for my Etsy shop. Oh yeah, and check out my new banner in the shop...I'd love to know what you think? I am always happy to find a new shop where I might feed my fabric addiction! Thanks for the link. I really think your heading is super!! !